Custard is a variety of culinary preparations based on milk or cream cooked with egg yolk to thicken it, and sometimes also flour, corn starch, or gelatin. Depending on the recipe, custard may vary in consistency from a thin pouring sauce (crème anglaise) to the thick pastry cream (crème pâtissière) used to fill éclairs. The most common custards are used in desserts or dessert sauces and typically include sugar and vanilla, however savory custards are also found, e.g. in quiche. Custard is usually cooked in a double boiler (bain-marie), or heated very gently in a saucepan on a stove, though custard can also be steamed, baked in the oven with or without a water bath, or even cooked in a pressure cooker. Custard preparation is a delicate operation, because a temperature increase of 3–6 °C (5–10 °F) leads to overcooking and curdling. Generally, a fully cooked custard should not exceed 80 °C (~175 °F); it begins setting at 70 °C (~160 °F). A water bath slows heat transfer and makes it easier to remove the custard from the oven before it curdles. A sous-vide water bath may be used to precisely control temperature. Mixtures of milk and eggs thickened by heat have long been part of European cuisine, since at least Ancient Rome. Custards baked in pastry (custard tarts) were very popular in the Middle Ages, and are the origin of the English word 'custard': the French term 'croustade' originally referred to the crust of a tart, and is derived from the Italian word crostata, and ultimately the Latin crustāre. Examples include Crustardes of flessh and Crustade, in the 14th century English collection The Forme of Cury. These recipes include solid ingredients such as meat, fish, and fruit bound by the custard. Stirred custards cooked in pots are also found under the names Creme Boylede and Creme boiled. 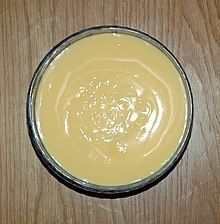 In modern times, the name 'custard' is sometimes applied to starch-thickened preparations like blancmange and Bird's Custard powder. 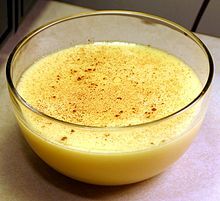 While custard may refer to a wide variety of thickened dishes, technically (and in French cookery) the word "custard" (crème or more precisely crème moulée, [kʁɛm mule]) refers only to an egg-thickened custard. When starch is added, the result is called pastry cream (French: crème pâtissière, pronounced [kʁɛm pɑtisjɛːʁ]) or confectioners' custard, made with a combination of milk or cream, egg yolks, fine sugar, flour or some other starch, and usually a flavoring such as vanilla, chocolate, or lemon. Crème pâtissière is a key ingredient in many French desserts including mille-feuille (or Napoleons) and filled tarts. It is also used in Italian pastry and sometimes in Boston cream pie. The thickening of the custard is caused by the combination of egg and cornstarch. Corn flour or flour thicken at 100 °C (212˚F) and as such many recipes instruct the pastry cream to be boiled. 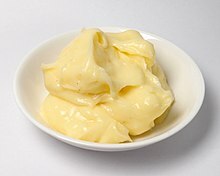 In a traditional custard such as a crème anglaise, where egg is used alone as a thickener, boiling results in the over cooking and subsequent 'curdling' of the custard; however, in a pastry cream, starch prevents this. Once cooled, the amount of starch in pastry cream 'sets' the cream and requires it to be beaten or whipped before use. When gelatin is added, it is known as crème anglaise collée ([kʁɛm ɑ̃ɡlɛz kɔle]). 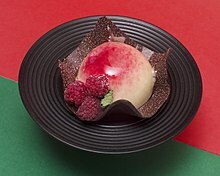 When gelatin is added and whipped cream is folded in, and it sets in a mold, it is bavarois. When starch is used alone as a thickener (without eggs), the result is a blancmange. In the United Kingdom, custard has various traditional recipes some thickened principally with cornflour (cornstarch) rather than the egg component, others involving regular flour; see custard powder. After the custard has thickened, it may be mixed with other ingredients: mixed with stiffly beaten egg whites and gelatin, it is chiboust cream; mixed with whipped cream, it is crème légère, [kʁɛm leʒɛːʁ]. Beating in softened butter produces German buttercream or crème mousseline. A quiche is a savoury custard tart. Some kinds of timbale or vegetable loaf are made of a custard base mixed with chopped savoury ingredients. Custard royale is a thick custard cut into decorative shapes and used to garnish soup, stew or broth. In German it is known as Eierstich and is used as a garnish in German Wedding Soup (Hochzeitssuppe). Chawanmushi is a Japanese savoury custard, steamed and served in a small bowl or on a saucer. Chinese steamed egg is a similar but larger savoury egg dish. Cooked (set) custard is a weak gel, viscous and thixotropic; while it does become easier to stir the more it is manipulated, it does not, unlike many other thixotropic liquids, recover its lost viscosity over time. On the other hand, a suspension of uncooked imitation custard powder (starch) in water, with the proper proportions, has the opposite rheological property: it is negative thixotropic, or dilatant, allowing the demonstration of "walking on custard". Eggs contain the proteins necessary for the gel structure to form, and emulsifiers to maintain the structure. Egg yolk also contains enzymes like amylase, which can break down added starch. This enzyme activity contributes to the overall thinning of custard in the mouth. Egg yolk lecithin also helps to maintain the milk-egg interface. The proteins in egg whites set at 60-80˚C (140-180˚F). Starch is sometimes added to custard to prevent premature curdling. The starch acts as a heat buffer in the mixture: as they hydrate, they absorb heat and help maintain a constant rate of heat transfer. Starches also make for a smoother texture and thicker mouthfeel. If the mixture pH is 9 or higher, the gel is too hard; if it is below 5, the gel structure has difficulty forming because of protonation prevents the formation of covalent bonds. ^ Barham, Peter (2001). The science of cooking. Berlin: Springer. p. 126. ISBN 978-3-540-67466-5. ^ McGee, Harold (1984). On Food and Cooking. p. 71. ISBN 978-0-684-18132-5. ^ Longrée, Karla; Beaver, Sharie; Buck, Paul; Nowrey, Joseph E. (1966). "Viscous Behavior of Custard Systems". Journal of Agricultural and Food Chemistry. 14 (6): 653–659. doi:10.1021/jf60148a033. ^ a b McGee, Harold (2004). On Food and Cooking. p. 71. ISBN 978-0-684-18132-5. ^ Kovacs-Nolan, Jennifer; Phillips, Marshall; Mine, Yoshinori (2005-11-01). "Advances in the Value of Eggs and Egg Components for Human Health". Journal of Agricultural and Food Chemistry. 53 (22): 8421–8431. doi:10.1021/jf050964f. ISSN 0021-8561. PMID 16248532. ^ Matringe, E.; Tan Luu, R. Phan; Lorient, D. (1999-09-01). "Functional Properties of Milk-Egg Mixtures". Journal of Food Science. 64 (5): 787–791. doi:10.1111/j.1365-2621.1999.tb15912.x. ISSN 1750-3841.